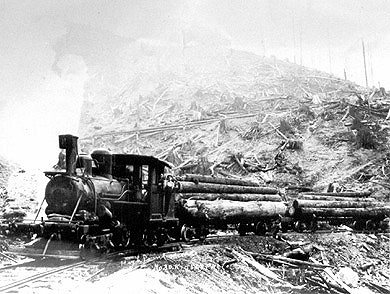 Moving stacks of long, heavy logs was no easy feat in the early logging days. In the next several installments of Looking Back, we’ll take a look at some of the locomotives and techniques used to move the area’s prime resource. In this Kinsey photo, taken in the mid 1920’s, the High Point Mill Co.’s Climax locomotive cruises around the north face of Tiger Mountain. The engine is pulling two of the four skeleton log cars built in Renton by the Pacific Car & Foundry Co.